Ocular ultrasound, also known as a B-scan, is a non-invasive test used to assess the structural integrity and pathology of the eye. B-scan ultrasound uses high frequency sound waves that are transmitted from a probe/transducer into the eye. As these sound waves strike the intra-ocular structures, an echo is reflected back to the probe and converted into an electrical signal. This signal is then reconstructed into a two-dimensional image on a monitor. 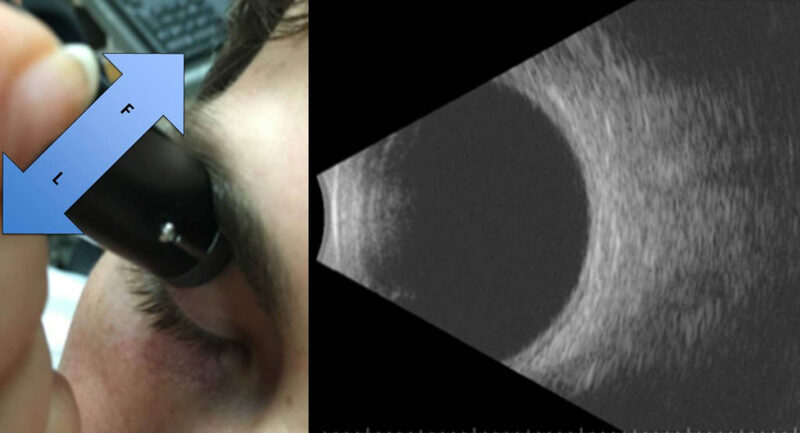 B-scan can be performed over the eyelid with coupling jelly. It can be used for a detection and measurement of a wide-range of pathological structures, including retinal or choroidal detachment, foreign bodies, calcium, and tumors. It can provide additional information when direct visual examination of the retina is not possible as can occur in patients with disorders such as large corneal opacities, dense cataracts, or vitreous hemorrhage. Refer Us to Your Friends!